EDIT: Here is the current incarnation of the game. There are three different ways to gain victory. 1) Standard Victory: Control 16 of the 30 supply centers on the board. 2) Alliance/Horde Victory: Destroy all three players of the enemy faction, and have more supply centers than either of your two allies. If there is a tie, play until one of you has more supply centers. 3) Magical Victory: Capture 3 of the 4 magical supply centers: The Dark Portal, Tomb of Sargeras, Caer Darrow, Dalaran. Home Centers: Home is where your Hall is built. There are no home centers in this variant; players can build units in any supply center they control. Rivers: I wanted Lordamere Lake and Darrowmere Lake to be in this without trapping fleets there, so I'm factoring in the southern Thondrodril River to connect Darrowmere to the Great Sea beneath it, and the River Arevass to connect Lordamere to the Great Sea in the north (it's on the retro map). Basically, the first river connects The Northlands, Tarren Mill, Alterac, and Caer Darrow by sea while the second river connects Tirisfall Glades, King's Road, and Lordaeron by sea. This allows Fleets to travel between these spaces. Caer Darrow: If we put both Darrowmere Lake and Caer Darrow in this game, then Caer Darrow would be an island completely surrounded by Darrowmere Lake. So instead, the "Caer Darrow" space represents both the island and the lake. It is the only ocean supply center in the game, and a player who controls it can build Fleets there. Dun Modr: I went back and forth on this one. North Dun Modr was important to the Khaz Modan campaign in Warcraft II, and it makes the northern Thandol area less of a no-man's-land without sticking Stromgarde on the border. But, South Dun Modr is just so handy as a western port--and it is current lore. Interestingly, some of the wiki articles seem to indicate that maybe there was an older extension of Dun Modr north of Thandol during the Second War, so maybe we could seize that interpretation and have both? Old Dun Modr, and regular Dun Modr? Forbidding Sea: Note that, due to its location, the Forbidding Sea is impossible to reach unless Air Units are allowed in the game. Unclaimed Lordaeron? : Though Stratholme, Tyr's Hand, and Hillsbrad would be part of Lordaeron, it'll probably be more balanced if we imagine that players have to "rally" these areas to the Alliance. The same goes for a few other places like Tol Barad (historically Stromgarde's at this time). Unclaimed Portal? : Yes! Like Dalaran, I wonder how the game will be if the Dark Portal starts out unclaimed, as if the Horde hasn't decided who gets the honor of guarding it yet. It'll probably still be the Dragonmaw-B.T.G. player, but it doesn't have to be. Made-up Names: Note that almost all of the Sea spaces have completely made-up names. Names I don't think I made up are: The Forbidding Sea, South Seas, Broken Isles. In general, I welcome suggestions of better names! So, ugly map. Non-proportional, but with rough boundary ideas. Might not lead to a very fun or balanced game, but it might---it's hard for me to tell. Any thoughts? And I've almost got a working version of the map. I was at first going to use the original map from the Warcraft II manual, but that would leave a LOT of unnamed places that I would just have to make up labels for... so it's going to use a bit of the Modern WoW map of the Eastern kingdoms to fill in the gaps. However, looking through the maps on the wikis, it's really hard for me to find a working map of the Azeroth and its border with Khaz Modan. See, the Lordaeron and Khaz Modan maps were EXTREMELY helpful. But the Azeroth map confuses me a bit. I've tried to use Blackrock Mountain (which is on both the Azeroth map and the Khaz Modan map) as a gauge of the continents, but I still have a few things to grasp. 1) On the Azeroth map, it almost looks like Blackrock Mountain, Stormwind, and Northshire are on the coastline. But that's not water, is it? What is that area of land north of Stormwind and west of the Burning Steppes? 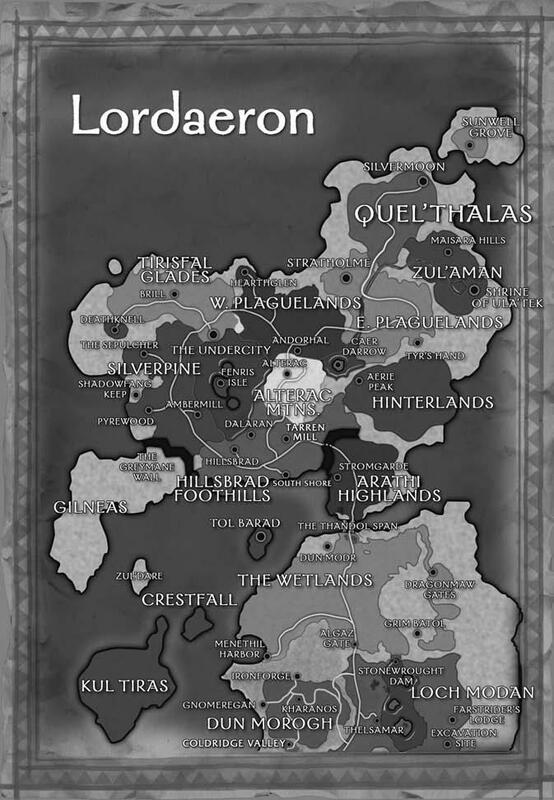 2) On the Lordaeron map, do you guys know what the Western Plaguelands would be called during the Second War? I'm thinking of just giving it a generic name, like the Northern Passage. But a real name would be preferable. 3) Similar deal with the Twilight Highlands (Dragonmaw Gates). Could they be called the Twilight Highlands during the Second War? Or did they gain that name only in the times of Cataclysm, with all the Twilight's Hammer stuff going on? Thanks for your help, guys. I really want this Diplomacy variant to be balanced, enjoyable, AND as accurate to the Warcraft world as possible! Last edited by BaronGrackle; 06-07-2012 at 12:33 PM.. I don't know about the plaguelands. Maybe something like Central-Lordaeron and East-Lordaeron? Thanks for the information! Okay, that changes things a little. I was just going to make it a generic province, but Northeron gets mentioned in the video game a bit because of the gryphon-riding Dwarves there, so it might become a supply center. It'd make Khaz Modan more valuable, anyway. EDIT EDIT: And it looks like no one is sure whether Northeron was meant to be the Twilight Highlands, or if it was meant to be an area around the Aerie Peaks (because of the gryphons). Thanks for the confusion of never putting it on a map, Blizzard. Hmm, that might work if there's no official pre-plague name for the area. Last edited by BaronGrackle; 05-15-2012 at 01:34 PM.. Thanks for the information! Okay, that changes things a little. I was just going to make it a generic province, but Northeron gets mentioned in the video game quite a bit because of the Dwarves there, so it might become a supply center. It'd make Khaz Modan more valuable, anyway. EDIT: Wait a second. Did you mean to say Arathi Highlands = Northeron? 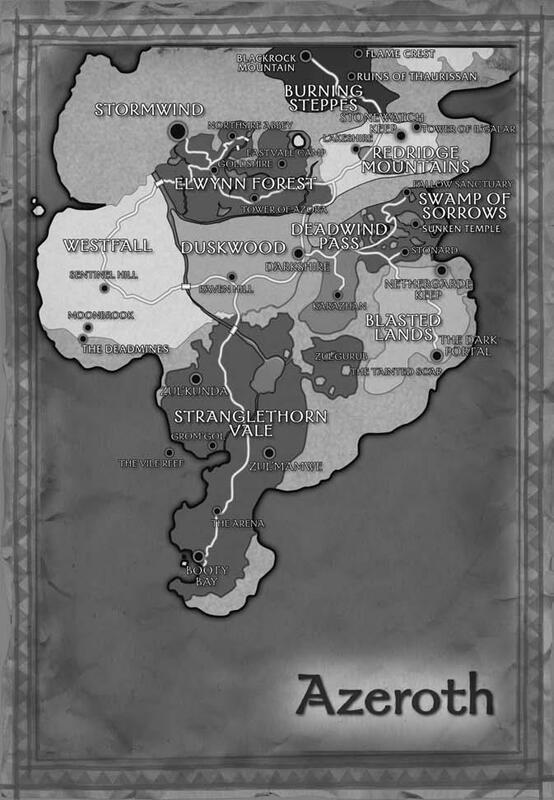 While earlier it seemed that Western Hinterlands is Northeron, apparently Ask a CDev hinted at Northeron being this part of Twilight Highlands, where most of Wildhammer settlements are located, with a larger part of the old cliffs being destroyed by Isorath. No, don't ask me how these dwarves were giving gryphons to the Alliance despite being in the middle of the Orcish-occupated lands. They... flew away... on gryphons, yes. And the Dragonmaw Clan was just chilling with that port in the east, no harm done, eh? Also, your Lordaeron map is old and non-canon. More like this. Last edited by Kir the Wizard; 05-15-2012 at 01:35 PM..
Yeah, I just edited that in my comment above. It might change the balance I had in mind, but it might work out in the end. See, I've been torn about whether to put Dun Modr north of Thandol (original Warcraft II version) or south of Thandol (modern version). I'm still undecided, but right now sticking Northeron in northeastern Khaz Modan would put it next to two other supply centers: Dun Algaz and Khaz Modan. That's great for Black Tooth Grin expansion, but it might mean that Dun Modr would fit better to the north of Thandol, as it was in the original version. Ah well. Anyway, do any of you know what is up with that northwestern area, on the Azeroth map, north of Stormwind but west of Blackrock? It's not supposed to be a coastline, is it? Hmm, I don't think I'm seeing the major differences. Other than some rivers coming out of Darrowmere Lake. What's the major change? Last edited by BaronGrackle; 05-15-2012 at 01:45 PM.. It was supposed to be the original entrance to Deepholm, if I'm not mistaken, but it was scrapped and we know nothing about this zone, just like with Northern Lordaeron. Might just add it to the Stormwind province. I also don't quite understand how are you going to play Azeroth in a Diplomacy-esque game based on the Second War. Lothar's army was an important part of the allied troops, but there wasn't any actual Azerothian state during that period, and besides it was much more clingy to Lordaeron with dear papa Terenas, rather than to Kul Tiras. How about uniting Kul Tiras and Gilneas in opposition to Lordaeron? Gilneas stopped looking so ugly. I also don't quite understand how are you going to play Azeroth in a Diplomacy-esque game based on the Second War. Lothar's army was an important part of the allied troops, but there wasn't any actual Azerothian state during that period, and besides it was much more clingy to Lordaeron with dear papa Terenas, rather than to Kul Tiras. I was going to give them a supply center for Southshore, the landing spot. It'd be rough to have the Second War without the blue colors of Azeroth running around. I separated the nations like I did because it sort of feels like the Azeroth survivors, Lordaeron, and Stromgarde were the major Alliance players in the war, during the game experience. How about uniting Kul Tiras and Gilneas in opposition to Lordaeron? I was going to make Gilneas impassable, like Switzerland in the original Diplomacy. From the modern perspective, you can imagine that they're contributing to surrounding Alliance armies but are too well-protected to assault. But from the retro perspective, they were neutral and had no Horde missions try to attack them. But the prettier design should totally be used. Pff, at this time Lordaeron is Stwormind. It also had blue colors, AND Southshore. Eh, as you wish, I just can't see Azeroth being in conflict with Lordaeron of all nations. These two were like best friends among the kingdoms. Hmm, that last point does catch my attention. It's tempting even to just have a different player for every single nation and clan, but that would make it a lot more crowded and harder for everyone to have "fair" chances at expansion. And grouping clans by two looks like it would work very well for the Horde, with each faction falling neatly into pro-Doomhammer, pro-Gul'dan, and pro-Blackhand. But you don't really get that effect with the Alliance nations in this war, do you? 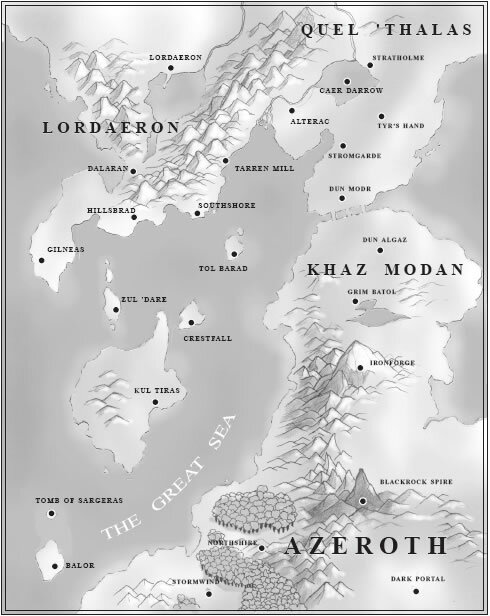 As you said, there's a strong camaraderie between Azeroth and Lordaeron (as Terenas lets the Azerothians settle in the southern part of his country, out of the goodness of his heart), and the manual briefly mentions a personal friendship between Lothar and Daelin Proudmoore, but there's not much else political scheming to go on. You know, except Alterac... but I put Alterac with Stromgarde mainly for their geographic closeness, and so a player could imagine that toughguy Stromgarde is pulling extra weight for weakling Alterac.... or if he does decide to betray the human nations, he can roleplay that Alterac is the one doing it. Stuff like that; it's not quite as elegant as the Stormreaver and Twilight's Hammer grouping. My thinking was that a Lordaeron-Dalaran player would have a lot of interest in the Northlands and Quel'thalas (Stratholme and Tyr's Hand are going to start out unclaimed, even though they would technically be Lordaeron's property---just imagine that you have to build a Town Hall and base there, or that you have to mobilize the eastern cities for war ) while an Azeroth-Kul Tiras player would have a lot of interest in the Great Sea and its islands, eventually leading back to continental Azeroth if they do well. Anyway, with the Lordaeron and Azeroth thing (now it's bugging me, because I'm thinking to the Warcraft III manual that mentions Turalyon conquering with both of these nations' banners together), an alternative would be to group them together while grouping Kul Tiras and Dalaran together. But if we did that, I'd probably want to move Dalaran to the coastline--right now I have it separated from the Great Sea by Southshore and Hillsbrad, in the current lore's position. But if I grouped Dalaran with Kul Tiras, I'd probably want to move it to its position on the retro map--on the west coast, northwest of Gilneas. In a few days I'll probably post some ugly maps. I'm thinking I'll post some different versions... so we can see how it'd look with Dalaran retro vs. Dalaran modern, as well as Dun Modr retro vs. Dun Modr modern. Last edited by BaronGrackle; 05-16-2012 at 06:32 AM..
You could unite Dalaran with the Hillsbrad Foothills zone, so that it has its way to the coastline. The actual "elegant" unions (lorewise) would be Lordaeron/Azeroth and Dalaran/Quel'Thalas, but that means having two centres at different regions of the Eastern Kingdoms... Even though this can actually be a feature when playing this factions! For example, Lordaeron starts strong, but has to protect its interests at all fronts. I think it would have to be a completely different game from what I have now, to incorporate the influence of nations like Quel'thalas, Zul'aman, and Ironforge. That type could be done, and it'd probably look more like the modern understanding we have of the Second War. But with this one, I do think I want to stick to the standard Human Nations and Orc Clans in the Warcraft II game, with Elven/Dwarven/Gnomish/NortheronDwarven and Troll/Ogre/Goblin/RedDragonSlave/BlackDragon allies being understood as part of the armies and fleets themselves. Standard Victory: A player wins by controlling half of the supply centers on the map. Faction Victory: A player wins if the three members of the other faction are destroyed, and he has more supply centers than any other player in his own faction. The player effectively controls the world as leader of the Alliance or the Horde. Magical/Omnipotent Victory: A player wins by controlling three of these supply centers: The Dark Portal, Caer Darrow, Tomb of Sargeras, Dalaran. Last edited by BaronGrackle; 05-16-2012 at 06:57 AM.. The Magical Victory way is interesting. Though, I'll admit, I was surprised at the idea behind a Diplomacy game based on one conflict with absolutely united Alliance and Horde. But I think it works if you implement "allied victory" path or even just support players playing it in historical alliances, like, for example, The Third Age mod for Medieval II did, if you allow me to bring some videogame examples here. Well, it also helps if you consider that the Second War had more backstabbings than World War I, which standard Diplomacy is based on. Last edited by BaronGrackle; 05-16-2012 at 07:12 AM.. Doesn't make much sense in lore. It should be Lordaeron and Azeroth, Alterac and Gilneas, Stromgarde and Kul'Tiras. And Dalaran grouped with Lordaeron and Azeroth? I'd agree with this. Alterac and Stromgarde doesn't sit well with me considering they would skirmish before the Second War and Thoras despised Perenolde. Dalaran seems to be a bit of an odd one out, I'd say that they should remain neutral among the human kingdoms but hostile to the other factions. Ugh, I don't think I could sit well with a neutral Dalaran. But all of you guys pointing out how well Azeroth and Lordaeron cooperated and how poorly Stromgarde and Alterac got along.... the points are taken. It'd be nice to be able to make it so that Alterac could be invaded by Stromgarde (according to lore) or Lordaeron (according to the game--an event that took up a whole Act chapter!). So yeah, with that. Alterac and Gilneas, hmm...? According to current lore, what exactly did Gilneas do during the Second War? I was going to make them impassable--to represent them not attacking and expanding, but also having an impenetrable defense. But, their desire to not involve themselves might pair well with Alterac's motives, for the sake of a tabletop game that only summarizes events. There's the possibility of adding the Burning Blade Clan on its own. But I'm not sure where it would start on the map, since they were nomadic. And it's already kind of crowded in the south.... the Stormreavers have Azeroth's west coast, the B.T.G.s have the Dark Portal and eastern paths to Khaz Modan, and the Blackrocks have the middle coast with a westcoast path to Khaz Modan. What do you guys think of the Burning Blade? ...a Horde that is more united than the Alliance. And that's just awful, for this time in history. I'd prefer the number of players to be balanced, or for there to be more Horde players than Alliance players. EDIT: Ugh... Gilneas and Alterac are so far away from each other, geographically, and separated by Southern Lordaeron/Azeroth. I'll take a look at it all later. This version might focus on trying to recreate the feel of the Warcraft II game more, and let another version try to recreate the feel of the novel. Because in the end, it'll have to focus more on one than the other I suppose. !! !THIS IS WHERE THE NEW POST BEGINS, DAYS AFTER THE OTHER ONE!!! Okay, reflecting on this (and reading the article on Isiden Perenolde)... yeah, it would make a lot more sense to group Alterac and Gilneas together, than sticking Alterac with anyone else. Despite my early plans, Alterac simply cannot be on the same side of Stromgarde or Lordaeron. And Dalaran would be a stretch. So we'll see how things work with players that are geographically separated--that's what playtesting is for! And Fojar, as much as I disdained your idea of keeping Dalaran "unclaimed", it's looking like that really IS the best bet. It is tempting to group Dalaran with Kul Tiras (and stick Dalaran in its retro west coast position), but I realized that doing so would screw up my "Magical Victory" plan. It would start the Kul Tiras-Dalaran player out with one of the magical sites automatically (Dalaran) and put them in strong competitive distance from a second one (Tomb of Sargeras). So right now, we'll probably make Dalaran a neutral supply center, and the understanding will be that it's an Alliance member that will pledge its forces to whichever Alliance nation recruits it first. Basically the same thing already happening with the Eastern Lordaeron cities and Quel'thalas. 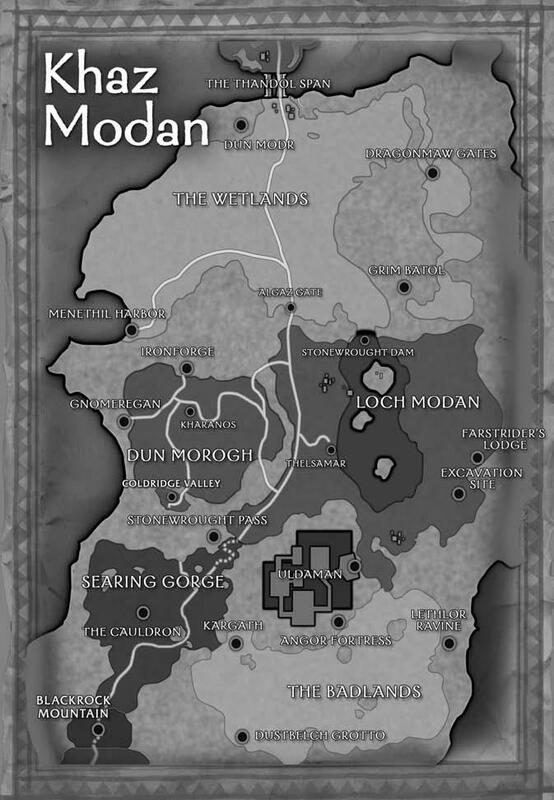 In other news, I think I am going to move Dun Modr south of Thandol, to its modern position. My reasoning? I want to give the Dragonmaw and Black Tooth Grin Clans a chance to have a coastline on the Great Sea without having to take it from another Horde player. Having Dun Modr south of Thandol could make this more possible, if that player can cooperate with the Blackrock-Bleeding Hollow. Okay. Gotta make a few map adjustments. Last edited by BaronGrackle; 05-18-2012 at 11:14 AM..
You could also divide the Twilight Highlands, with the northern part belonging to Northeron dwarves and the southern divided between the Dragonmaw Port and the Twilight's Hammer. That area might not be a supply center anymore. Since there's no way to get fleets from the Forbidding Sea to the Great Sea, it didn't solve the problem of how to get the Dragonmaw-B.T.G. a chance at a coastline to build ships. By sticking Dun Modr south of Thandol in its modern position, that would solve the issue. Yet then Khaz Modan would have Dun Modr, Dun Algaz, and Grim Batol right by each other with Ironforge nearby. Northeron/TwilightHighlands could be another center right by the other ones, but it might make the area way too valuable. Still deciding. Speaking of Dragonmaw... any opinions on whether to have air units? They'd probably move on land or sea spaces, and they'd be able to take away enemy ownership from a center, but they wouldn't be able to capture the center themselves (so it'd be better for players to use them as support for armies or fleets). Example: A Blackrock-B.H. Air Unit moves from Lake Lordamere to Lordaeron City during a Fall turn. Lordaeron-Azeroth loses control of Lordaeron City, and it becomes an unclaimed center. If the Blackrocks had occupied Lordaeron with an army or a fleet, it would have become a Blackrock-B.H. center instead. It might just be easier to leave out air units. Before I finish and post up this ugly prototype map, do any of you know the names of prominent locations on the Great Sea? I've named Menethil Harbor as a sea space (even though it should technically be the land on the coast), and I've named the sea space south of Hillsbrad Shores of Lordaeron (after the Human Act I), but other than that I've really found myself making up names. Random things like "Bay of Thandol" or "Gulf of Gilneas". And when I do post the ugly map, I'll definitely want recommendations from you guys on what to call the "made up" spaces. But in the meantime, are there any specifically named ocean spaces in WoW, in this part of the Great Sea? And also, are there any well-established Oil Patches in the ocean, which might be strategically vital? Last edited by BaronGrackle; 05-21-2012 at 12:26 PM.. The northern part of the Highlands was Northeron. It used to be covered in snow and have a few villages, you can see where one of them fell into the sea. I believe it was the Cataclysm and the Twilights Hammer meddling that caused all the snow/ice to melt. That whole mountainous region with Thunder peak and Kirthaven is what I assumed Northeron was. I think this was from Cdev? Okay. Here is my ugly, ugly, awful, nonproportional, ugly, prototype, ugly draft map. 1) Standard Victory: Capture 15 of the 30 supply centers on the board. 2) Alliance/Horde Victory: Defeat all three players of the enemy faction, and have more supply centers than either of your two allies. If there is a tie, play until one of you has more supply centers. Caer Darrow? : If we put both Darrowmere Lake and Caer Darrow in this game, then Caer Darrow would be an island completely surrounded by Darrowmere Lake. So instead, the "Caer Darrow" space represents both the island and the lake. It is the only ocean supply center in the game, and a player who controls it can build Fleets there. Made-up Names: Note that almost all of the Sea spaces have completely made-up names. Names I don't think I made up are: The Forbidding Sea, Menethil Harbor, South Seas, Broken Isles. In general, I welcome suggestions of better names! EDIT: Home Centers: Home is where your Hall is built. There are no home centers in this variant; players can build units in any supply center they control. Last edited by BaronGrackle; 05-22-2012 at 08:10 AM..
Can you make Twilight's Hammer purple? They look... too much like Azeroth otherwise. Those are the standard Diplomacy colors on a physical board game (those six, plus yellow). That being said, this probably won't be PLAYED on a physical board game. So yeah, I think I will change that color to Purple. I'll probably also change Alterac-Gilneas to Orange so I can have the Dragonmaw-B.T.G. as Black. In Warcraft II, most of your Orc missions are played as the Red of the Blackrock Clan, but the Khaz Modan ones are played as the Black of the Black Tooth Grin (probably so you can fight Red-colored Stromgarde), and it'd be nice to recreate that. One obvious point I keep forgetting to mention... this variant won't differentiate between home supply centers and regular supply centers, so players can build units on any centers they control---not just the ones they start out with. EDIT: Hmm, the uploaded version seems scaled down a bit and harder to read. Let me know if you folk can't read something, or if you're not sure where I stuck a connection. Last edited by BaronGrackle; 05-22-2012 at 06:13 AM..
That's awesome. Both Black Tooth Grin and the modern Dragonmaw Clans use black colour.